Wetlands graphic: Wetland Function Estimates from Landscape Level Analysis and Field Assessments report. Wetlands are nature’s resiliency plans, and according to the EPA the ecosystem services they provide are valued at billions of dollars. What if the 50 acre AES Redondo Beach Power Plant property currently up for sale was restored to a wetland? Acting as natural mechanism for protection against pollution, flood and erosion, wetlands are workhorses when it comes to ecosystem services. They also provide biological diversity, fish, and wildlife habitat, while also recharging increasingly valuable groundwater. Importantly, they can also help buffer the effects of sea level rise. The City of Redondo Beach has been debating what to do with the closure of the natural gas-fired power plant for years and I believe the natural answer is to construct a wetland. Tanner Springs Park in Portland, Oregon is not a restored wetlands, but it mimics one. 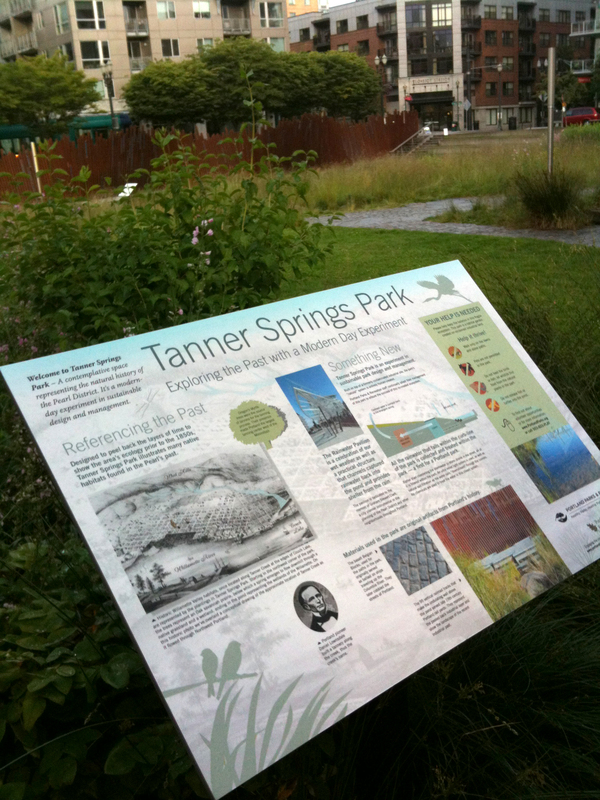 As a bold gesture of the local ecology in a post-industrial Pearl District, the park’s central feature is a stormwater management waterscape expressing the history of Tanner Creek. It’s hard to believe but Tanner Creek once flowed directly into Couch Lake, the very site now known as Pearl District. Wanting to learn more about the technical processes of this simulated wetland, I turned to the generic water treatment diagram at the park’s information kiosk, but it proved to provide little insight. I also went to the German landscape architect’s website, Atelier Dreiseitl, hoping to gain some technical insight into the functions, but again to no success. My primary question was where Tanner Springs Park was receiving its supplemental water to sustain the park’s wetland feature between rainfall? I understand that some of the water is from stormwater, since 100% of water that lands on the site is circulated into the wetland system. But what about during days when it has not rained and water has evaporated? Yes, Portland gets a lot of rain – around 40 inches per year on average. But during the summers, it’s hot and dry. I suspected the park had another water source that sustains the park. So there was my answer. I just wish there was a better diagram that communicated the whole picture of Tanner Springs Park.